Malcolm Turnbull is too lazy to govern, but too in love with glory to leave. But leave he should. Because he doesn't have what it takes. Not any more. Turnbull is rich and has been pampered too long. Now he doesn't have the energy or the inclination to really run the country. Once, long ago, when he was hungry and ambitious, and full of ideas, he may have made a good prime minister. But now – now he is broken and bowed, and fast, fast growing old – he doesn't have what it takes. No. Not any more. Once upon a time, a young, bright Turnbull was a Rhodes Scholar, and he won the Spycatcher case, and he fixed things for Kerry Packer, and ran banks, and made gold deals with Russian gangsters. Back then, Malcolm may have run the country with flair and panache. Maybe he would have. Or maybe not. Then Turnbull tried to turn Australia into a republic and he put millions of his own money into it. But he was tricked by Howard, who lied to him, and the public rejected his grand and glorious plan. Rejected him, in truth. He accused Howard of breaking the nation's heart, but really it was his own heart that had been broken. And perhaps the picture he held of himself in his head. In his hubris. 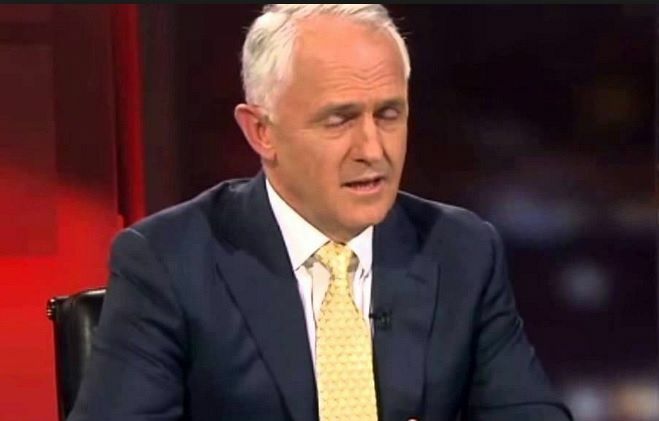 A few years later, Turnbull entered Parliament — into the Government of the very one who'd broken his heart. And there he dallied and did nothing — except pay some millions to a few friends who said they could make it rain. They lied to him, of course. The heartbreaker lost and, not too long after, Turnbull became the leader in Opposition. But by now he was tired. And no longer had the patience to grind the enemy down. And so he fell for a tantalising tale by a wretched man called Godwin that looked like it might deliver him his crown. But, of course, Godwin's tales were wretched lies, and so he lost the love of the people and his Party, and was discarded for another enemy — another wretch, this one called Abbott. He nearly gave up then, but the lure of glory was still too strong and so he stayed. So that eventually, when this enemy – an utter, utter fool – had follied one too many times, he replaced him. The public was placated. For a time. Turnbull still spoke smoothly and seemed so much more accomplished. Surely he would succeed? But no, sadly, he was just as flawed as the fool. Turnbull had been too long used to leaving proxies to pander to his piques. Preferring to pronounce and delegate others to do what he deigned. Too high and mighty to delve down into the details. And too old. And too tired. And much, much too lazy. And so his Government did nothing for months. Then it dithered about this and postured about that. After almost an eternity, it brought down a Budget that didn't do very much at all, except give millions and billions to his friends at the big banks and big businesses. And then he called an election and a long – far, far too long – election campaign. But he only campaigned until midday each day and even then only rarely among real people. He won. But barely. And only after he had given millions to his impoverished Party. Yet still he raged against the Opposition, whose "monstrous lie" had nearly stolen the election. Had nearly broken the nation's heart — and his own. Again. Last week, he announced a royal commission into the horrors inflicted on children in Territory gaols. He did it too soon and appointed the wrong judge. Turnbull was just too lazy and hasty to bother to look into who might be right for the role and who would be wrong, and so he selected the very first person presented to him. Of course, chaos and crisis ensued for days. But then the judge – besmirched and belittled – resigned and the Government appointed two others in his stead. This week, the Reserve Bank cut interest rates, but his friends at the big banks didn't pass on this cut to the mortgage paying public. So Turnbull waggled his finger at them and then hastily announced a yearly tea party for them in Canberra. Rather than a royal commission that would actually get to the bottom of their culture of gouging and blatant criminality. Malcolm's fat cat friends laughed and laughed, and popped champagne corks. Then Turnbull went back to his Point Piper mansion. To his Harbour views and beloved truffles. To his servants and hangers on. To his memories of glory days. To his verandahs and brandies. To his haze. To his torpor. He should stay there. Because he doesn't have what it takes to be prime minister. No. Not any more. You can follow managing editor Dave Donovan on Twitter @davrosz. This article was first published on the Independent Australia weekly newsletter. If you would like to receive these editorials every week – along with all the other extras available to IA subscribers, including exclusive IA podcasts, merchandise and additional articles and material – subscribe to Independent Australia for as little as $4.67* a month. Find out more about IA subscriptions here. * Based on an annual supporter's subscription.